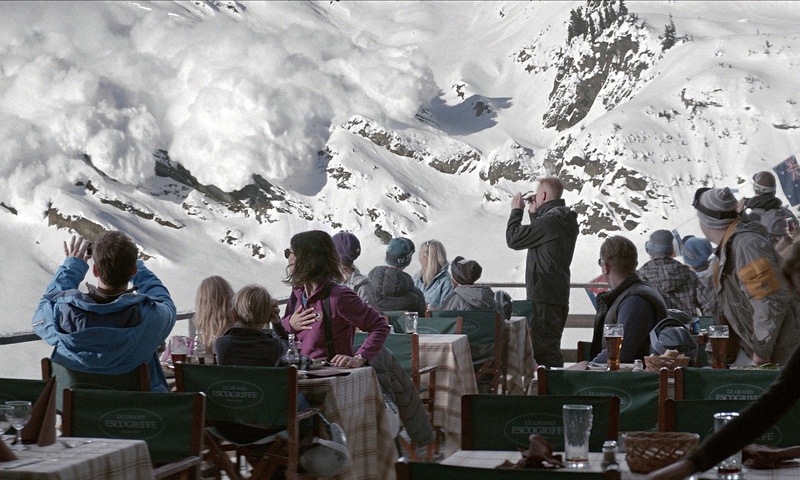 Force Majeure charts the slow-motion unravelling of an affluent model family. As Tomas (Johannes Kuknke), Ebba (Lisa Loven Kongsli) and their two children dine during a skiing holiday, they become briefly convinced that an avalanche is approaching. Faced with a moment of reckoning, Tomas impulsively grabs his iPhone and abandons his loved ones to their fate. In darkly comic, excruciating detail, writer-director Ruben Östlund explores the aftermath of this event as the family confronts Tomas’ failure to conform to his socially-ordained role. Ahead of the film’s release we spoke to Ruben about gender expectations and nuclear families. Were there any real life events that inspired the story? The starting point was that I’ve skied a lot and have made ski films and wanted to make something set in a ski resort, but hadn’t known how because it’s such a kitschy world. Then I saw an online clip of a group of tourists sitting at an outdoor restaurant, similar to how it’s visualised in the film. They see an avalanche and think it’s beautiful but seconds later they’re screaming in panic and fleeing, before realising their error. They become ashamed of themselves, of losing control and exposing something that is uncivilised. I was talking about the incident to a friend. You could tell that he’s done a lot of things in his life that he’s ashamed of. I’d had the idea of putting a family in that situation, and he said “What if it’s only the father that runs away?” Immediately I realised this would expose expectations of gender. I started to talk with a lot of different people, and many had personally experienced women losing trust in men because of how they behaved when it came to a crisis situation. As I was watching I kept thinking about what happened on the Costa Concordia. I thought it was extremely interesting how the captain of that ship started this lie that he fell into a lifeboat to avoid losing face. At one point Tomas says “I am a victim of my instinct”, which is a direct quote from that captain. Ultimately the worst thing that Tomas does isn’t momentarily running away but continuing to lie about it. I agree with that, but it’s so painful to lose your identity. If you’re a man and a lot of your identity is this expectation of what a man is, then lying about it is a way of trying to avoid that moment. The outside perspective of who we’re supposed to be has such a strong influence over our behaviour. In our society a man is supposed to sacrifice himself when there’s a sudden outside threat. As a man or a woman you’re adapting to the role of being a man or a woman, to the expectations that come from those cultural influences. For me Tomas and Ebba are just performing the characters of the woman and the man in a family, acting like what’s expected of them. It’s role-playing. When tested, that brings out silly behaviour. Were you trying to deconstruct the idea of a family unit? It’s not very often that we see the nuclear family from an economical and historical perspective. We think of it as a fundamental thing about being a human being, but the actual term “nuclear family” was invented in the 1950s. Before then we lived in large families, and the industrial movement made us move into towns and small flats so we had to cut the bands with an older generation. To motivate ourselves in this new lifestyle we conceived the idea of a nuclear family, but it’s totally stupid to not have grandparents around. In the large family there were more adults taking care of the children that were being brought up. The nuclear family is so much more vulnerable. If the mother and the father are not functional then the children are much more exposed. If we look at the kind of lifestyle we can see that we’re following a pattern: we’re going down to individuals, which is the most efficient consumer unit. Stockholm, for example, has the most single person households of any city in the world. If there is eventually only one person in every household then they have to buy all the equipment that they’d buy when there are four people. We’re going from nuclear families to living alone in our apartments, being more and more efficient consumers all the while. Is Force Majeure offering a critique of that process? Does it argue for a different way? No, that part is not the film criticising. I wanted to look at the kind of family that is upper middle class and has that kind of lifestyle. By our criteria Tomas and Ebba have succeeded. They’re a beautiful couple staying with their beautiful children in a five-star luxury hotel. But then actually the perspective of the film is we’re looking down at them. These poor people! Going out in the hallway to have arguments about a catastrophe that never happened. You’re right that they’re not actually in real peril at any point. Do you think Tomas and Ebba are looking for things to be unhappy about? We have a culture today where we’re allowed to put 99% of our time and concern into our relationships. There’s something about this lifestyle that creates existential crises. We feel like love should be a problem, and we hear it in pop music over and over again. In movies, on television, it’s all relationship challenges. As long as we have that kind of focus for our lives we won’t be able to look at society’s problems from a proper perspective. I wanted to question that.